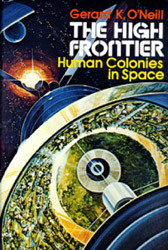 Dr. Gerard K. O’Neill is author of The High Frontier: Human Colonies in Space, first published in 1977. It proposed the construction of giant solar powered cylinders, inside each of which as many as ten million people could live in space. Materials for these colonies would come from mining the Moon and asteroids. Manufacturing space solar power satellites to provide clean, limitless power for the Earth and in space would sustain the colonies, which would be built at the L4 and L5 Lagrangian libration points on the Moon's orbit at equal distances from both the Earth and the Moon. An object placed in orbit around L5 (or L4) will remain there indefinitely without having to expend fuel to keep it in position. The L5 Society, one of the precursors of the National Space Society, was founded around his ideas and from his mailing list. 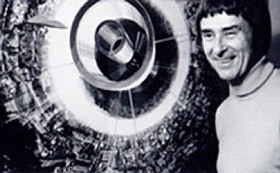 Although Dr. O’Neill never achieved his dream of retiring to one of these colonies, his ideas live on and are within reach of the technology of the near future, with companies such as Made In Space demonstrating additive manufacturing in microgravity and Deep Space Industries preparing to bring materials back to the vicinity of the earth or moon from the asteroids. Receive a custom black wool Voyager Circle Jacket, with its NSS logo brass buttons, NSS and Circle logos embroidered on interior pockets, and silk lining depicting beautiful images of O'Neill Cylinder Colonies by Don Davis and Rick Guidice, courtesy of NASA. * Wear it with pride and be recognized and honored at NSS events such as ISDC’s, Chapter Meetings, and Space Development Congresses. Enjoy a special meeting room and the ability to reserve a table for you and your colleagues at ISDC meals. Our Bequests Coordinator will arrange meetings with NSS Leadership at ISDCs or calls at other times so you can discuss your ideas for the Society’s future, and desirable life experiences that NSS might be able to arrange for you and other Circle members (such as visits to NASA or commercial space partner facilities). A signed, non-binding Letter of Intent to remember NSS in your will, plus a $500 current gift. A current gift through one of the tax advantaged means described on our website with a binding value of at least $5000. *The Blazers will be manufactured as soon as there are 50 members in the Society, so they will most likely be presented at the 2019 ISDC in Washington DC, or at your home or NSS Chapter meeting in the Spring or Summer of 2019. Can I designate my gift to go to a specific cause I care about, or name my gift? Gifts of $1000 or less go toward our general operating budget to support NSS’ many programs in education and policy to advance our future as a spacefaring society. Gifts greater than $1000 go into the NSS Endowment Fund, which is designed to generate funds for the operating expenses for our programs in perpetuity, unless the bequest is “donor restricted”, as described below. Gifts greater than $10,000 may go into a Supplementary Endowment Fund, at the donor’s request. This involves the creation of a new endowment fund, one which supports a specific educational project or program The specific use must be one that is approved by the NSS Board of Directors, so please contact NSS headquarters for assistance. Gifts greater than $50,000 may go into a “named” endowment (one that honors a specific person, persons, or company and may be designated for a specific purpose); please contact NSS headquarters for assistance.